Seattle Weekly has compared them favorably to the Shins, the Deli Seattle Magazine has praised them for their “flashy, out-of-control pop sensibilities,” and Seattle radio 90.3 KEXP named their song “Go For a Walk” their Song of the Day, calling it a “brilliant pop tune and nothing you should skip out on”. Think vintage Flaming Lips with a splash of NES and a dash of the Unicorns, and you get the idea. Lead vocalist/guitarist Adam Prairie grew up with his brother/drummer Chris in the middle of Midwestern corn fields in Clifton, IL. The two played whiffle ball and Nintendo, watched the original Star Wars trilogy obsessively, and learned to play guitars and Casio keyboards in the bedroom they shared for most of their formative years. They wrote a few songs in high school, but they mostly tinkered with sounds until Adam left home to study at Knox College in western Illinois followed by Chris a few years later. Since then the current lineup, rounded out by keyboardist Christina Ellis and bassist Ben Lewis, has released two albums, and the latest, Appetite for Distraction, inspired this praise from Seattle Weekly: “While the group’s fun-loving, reverential spirit keeps them orbiting their influences, their high-energy songbook, full of stories about ghosts and robots and brain eating dinosaurs, captures the essence of goof-pop with upbeat, irrepressible glee.” The lead track from Appetite for Distraction, Mr. Ghost, was also included on KEXP’s Music That Matters Podcast shortly after the album was released. Their follow up EP, Feel the Cosmos, introduced a whole new audience to the Hoot Hoots and brought more glowing praise. 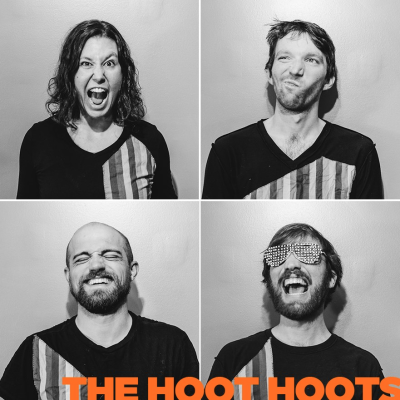 Seattle Metropolitan Magazine named it their album of the month in December 2012, saying it was a “fun-loving and energetic brand of power pop suited for sing-alongs.”Following the EP’s release, Indie Rock Cafe named the Hoot Hoots one of their 5 DIY Band to Watch in 2013. They’ve also relentlessly hit the road the last couple years, making stops in the Midwest, Southwest, Texas, West Coast, and all over the Pacific Northwest. And they somehow manage to do it stuffed into a Toyota Prius.